Plan to attend the 2019 Canadian Surgery Forum in Montreal, Quebec! Taking place September 4th to 7th at the Fairmont Queen Elizabeth Hotel. 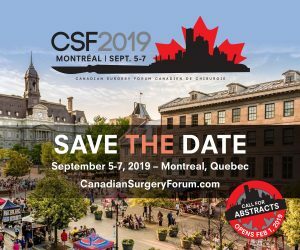 Come attend the CSF in Montreal in 2019! St Mark’s Hospital & Academic Institute are delighted to announce the 17th Annual Congress: Frontiers in Intestinal and Colorectal Disease, it will take place from 27th to 29th November at Royal College of Physicians, London. http://www.stmarksacademicinstitute.org.uk/courses/frontiers-in-intestinal-and-colorectal-disease-2019/ The visiting professors for 2019 will be: Sebastian Biondo (Centro Médico Teknon,Barcelona), Siew Ng (Prince of Wales Hospital, Hong Kong) and Neil Shepherd (Cheltenham General Hospital). Further information is available on our website: http://www.stmarksacademicinstitute.org.uk/courses/frontiers-in-intestinal-and-colorectal-disease-2019/ There is a discount of £25 for a full registrations received before 1st October 2019.